When I was a teenager, my parents were not only the lead pastors of a church, but my Dad helped oversee a group of about 25 churches in our fellowship’s network. It was part of his role to help churches and ministers through challenges they might face. He had a tough job one year in particular when five ministers in our group made poor choices which caused them to lose their credentials and ministries temporarily. One story from that year sticks out vividly in my mind because of the lesson I learned from one minister’s journey. In fact, I would say it has partly shaped who I am as a person and minister today. I had gone to bed after the 10pm news had gone off, but I was awakened not long after going to sleep by a sickening feeling in my stomach. Whatever I had eaten had not agreed with me, and it wanted out. I jumped out of bed and crossed the hall to the bathroom. How can I say this delicately… I had barely knelt at the altar of the porcelain god when my offering came forth. Mom was out of town for some reason, and so I hollered for Dad… because I don’t do sick alone. He quickly came to my rescue with a wet rag, but almost as soon as he had come to help me, our doorbell rang. I wondered out loud who it might be, and he informed me that a minister in our area was coming over to talk about something serious. Dad asked if I was going to be okay by myself, and let me know that he would come back to check on me. By that time, I had gotten rid of whatever was ailing me, and so I told him to go on because I’d be fine. With that, he left to answer the door, and I cleaned up and went back to bed. True to his word, Dad came and checked on me after the man and his wife left. When I asked what it was all about, he told me to go on to sleep and we could talk about it the next morning. I slept, the sun rose, and the next morning I asked again. This time Dad shared the sad news that the man had made a series of bad choices which could have cost him his family and his opportunity to minister. But the man was contrite, and his family was gracious. For things to be restored, the man would have to step away from the pulpit for a year, go through counseling to help heal his marriage, have regular accountability meetings to chart his progress of being restored to ministry, and attend a different church… our church. In fact, Dad said the couple would begin attending our church that very next Sunday. In that moment… and in the moments that followed beginning with that first Sunday when I smiled at this couple, hugged them, and welcomed them as a part of our church family… I learned that real love renders people shameless. 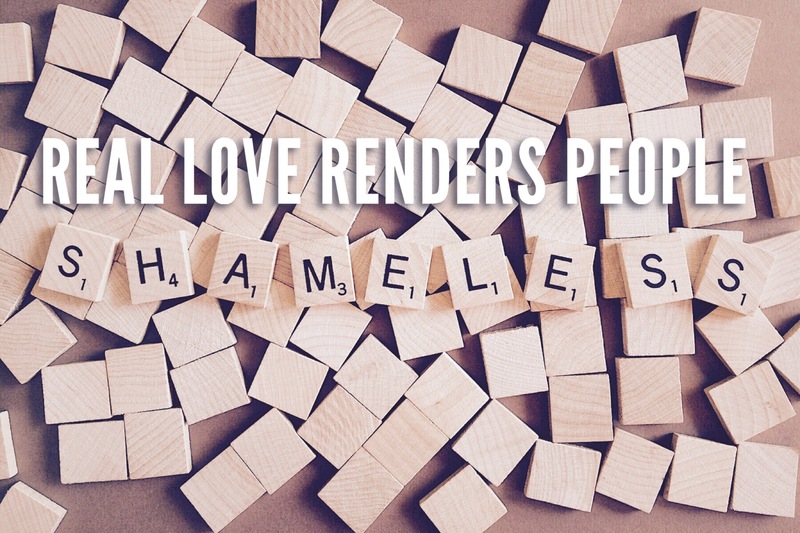 That’s what God does with each of us… He loves away our shame. He knows that we already feel badly enough about blowing it in life. He knows that we don’t need to be reminded of how imperfect we are. 1 John 4:18 tells us that “perfect love expels all fear.” Isn’t that what shame is… fear that others will see our junk and realize we don’t have it all together? Fear that people wouldn’t accept us if they knew what we are really like, or if they knew what we have done? But love overpowers fear, kicks it out & renders us shameless. That couple walked the year-long journey back into ministry while attending our church. It was a thing of beauty to see love conquer shame, and I’ve never forgotten it. So, let me encourage you today to love people who don’t deserve it. Let your love prove to them that they don’t have to fear what you will think about them or say to them. Let your love render them shameless, and watch in amazement as they transform before your very eyes into all they can become.